Missing or corrupt Registry error message - PC Buyer Beware! Corrupt Registry: When I switched on my Windows 7 Home Premium desktop PC, it gave me the message, shown in the image I sent you of its screen. 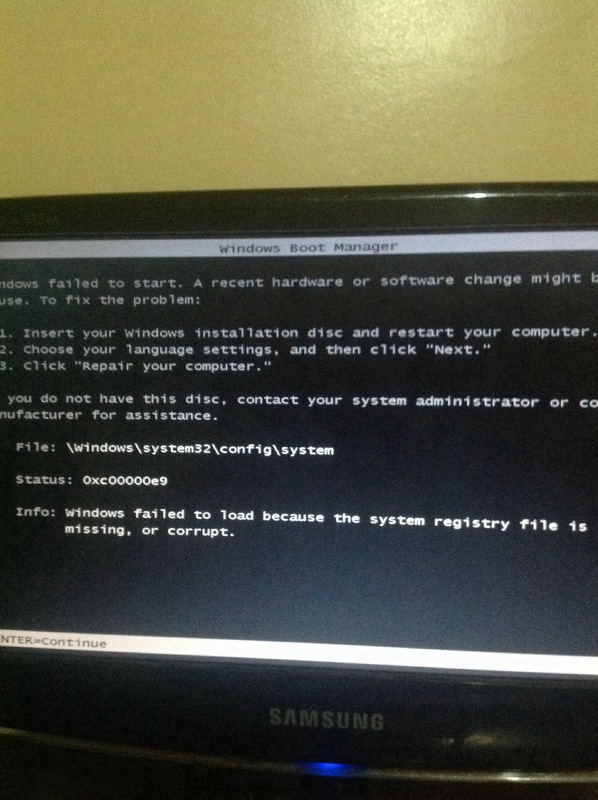 – “Windows failed to load because the system registry file is missing or corrupt.” Please help. – Insert your Windows  installation disc and restart your computer. – Choose your language settings and then click “Next”. Firstly, if you use an old Win7 installation disc on a fully-updated Win7 computer to do repairs to corrupt files, it has older files on the disc than on the computer and not only might fail to recover the system but might screw it up further. An up-to-date install disc can be created from a download from Microsoft’s website. Read the following post on that topic. Moreover, in order to boot the system from a CD/DVD disc or USB flash drive requires that the boot device is set as first in the order of boot devices in the UEFI/BIOS. 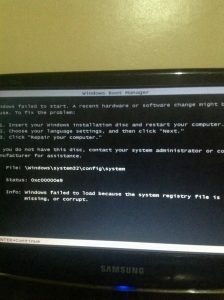 If you cannot boot from a disc or flash drive, the boot settings of the boot order is usually the cause. The boot problem in this case is that the files in the system directory – the path to which is: C:\windows\system32\config\system – are missing or corrupted. Fortunately, Windows already has a backup of the system directory. Therefore, it is only necessary to restore that backup to fix the problem. Place the Win7 installation disc in the CD/DVD drive and allow it to boot the system. How old the disc is does not matter, because, in this case, system files are not involved, you are just using the disc to bring up a Command Prompt so that you can use commands to make Windows restore its backup of the corrupt Registry. Note that you can also boot the system and access the Command Prompt with a Win7 repair disc that you make Win7 create. To create a repair disc just enter the word repair in the Search box and click on the link that Windows provides. Using the Win7 installation disc, when you get to the screen that sets the language and keyboard, press the Shift and F10 keys to bring up a Command Prompt. Then enter the following commands, as is. Lower case letters can be used, because the prompt only works using them even if you enter capital letters. Note that Windows uses the C:\ drive letter by default, even in, say, a Windows 7/Windows 10 dual boot system. The booted version of Windows is given the C:\ drive letter and the version of Windows that was not chosen to boot the system is given the D:\ drive letter. If for some reason you changed the Windows drive letter to a different letter, use that letter instead of c in the following Command Prompt commands. The cd command changes the directory to c:\Windows\system32\config from where the ren command renames the system directory to system.backup. Then the copy command copies the backup in regback\system to the system directory, restoring the backup. The image below shows the Command Prompt with the first command – cd c:\windows\system32\config – entered.